Amanda Leigh Lichtenstein shares about gift-giving in Zanzibar and gives five playful responses for the traveler caught without a “gifty” when one is warranted. While walking home from the market, I heard the infamous call: “Giiiiiifty!” A young man who I barely know but see often on this particular route took one glance at my overflowing market bag, tilted his head playfully, looked up at me with a smile, and said, “gifty!” He was hoping I would reach into my bag and hand him a clove of garlic, a bag of raisins, something little – a gift. He wasn’t the first to call out “gifty!” to me. A year-deep into life on the island of Zanzibar, I’d been playfully approached by young and old, men and women, rich and poor, all in a seemingly good-humoured attempt to connect, make contact, or strike up a conversation. The whole “gifty” thing used to catch me completely off guard, calling quick attention to my obvious confusion. I never knew what to say. Was this pleading? Begging? Joking? Demanding? What kind of gift? And what was the occasion, anyway? I used to stumble through these encounters, sometimes annoyed, yet always grateful for the chance to laugh it off and keep walking. Was it just me, or was this a fair-game, gift-giving free-for-all, where I, too, could gently demand a present? Each time, I worried that I’d yet again made a major cultural blunder, missed an important holiday, or misinterpreted a social cue or custom. I never knew what to say. Was this pleading? Begging? Joking? Demanding? What kind of gift? And what was the occasion, anyway? Over time I realized that gift-giving is a major thread in the great tapestry of Swahili coastal culture. The gift is the heartbeat of an intricate system of social exchange. Notions of gift-giving along the Swahili coast stem from traditions and customs rooted in African and Arab worlds, both realms known for their over-the-top hospitality. It’s the generous gesture, the thoughtfully tied sack of flour, the signature bundle of shillings that, when exchanged rightfully, is a bond that seals Swahili friendships. This kind of gift-giving is very different from those warped charitable exchanges between travellers and locals, too often fuelled by the strange engine of aid and development. Think: pack of ball-point pens tossed from an open bus window to a bouquet of reaching hands. It’s not that those gifties aren’t totally appreciated. It’s just that they are typically short-lived, meaningless, or just plain random. It’s the kind of gift exchange that just barely scratches Zanzibar’s zawadi surface. Swahili gift-giving is intricate and intimate, infused with faith and the sweet promise of reciprocity. The trick is discerning a genuine opportunity for gift-gifting versus the random guy who just wants to have a little street-side chat or get lucky with a few sticks of tasty grilled meat. Not that there’s anything wrong with surrendering to someone’s coy request for a bowl of urojo or a plate of hot chipsi. It’s just that you don’t have to respond to every request. Still, there are several genuine occasions during which the right gift at the right time affords you some of that hard-earned cultural cache within the Swahili world. Along the Swahili coast, visiting a friend or family member, especially in another village or town, warrants bringing a gift as a gesture of gratitude for what is typically a warm and hearty welcome of chai and conversation. Especially if you’re spending the night, a gift is way of stitching yourself into the family fabric. A sack of flour or sugar, textiles, or fruit are tokens of belonging and are gratefully accepted. Small gifties for the children, like sweets or art supplies, also light up a room, though it’s not expected. If you’re coming from another country or culture, it’s sweet to bring an item from your world, but it’s not necessary to spend excessively. The gesture, the exchange, is the gift. The four days following the holy month-long fasting period for Muslims is one of the most ‘blingtastic’ time of year for Zanzibaris. In full sequined glory, women and girls promenade on the streets, showing off their hennaed hands and feet, wearing their finest bui-buis, ball gowns and head-scarves. 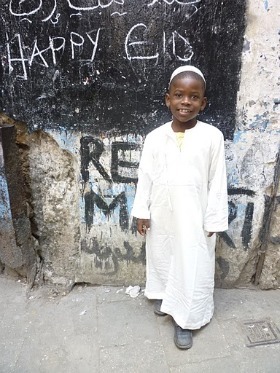 The men and boys walk alongside wearing crisp white kanzu and an intricately embroidered kofia. During these four days, gift-giving is feverish and compulsive, joyous and contagious. 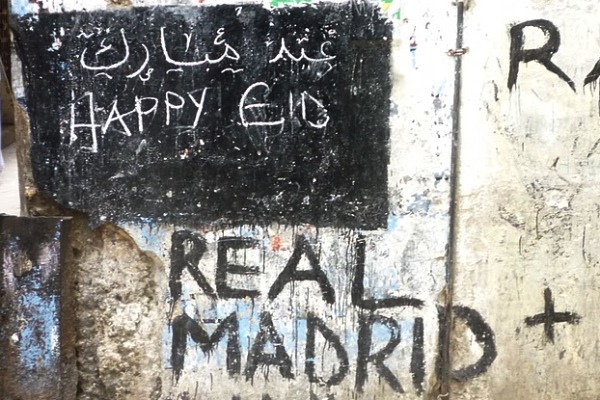 The custom is for children to go door-to-door, knocking for their siku kuu, their “big day” gift, their Eid blessings. While children usually ask adults they already know, some have fun pitching a request for their siku kuu to any adult on the street. This usually means pressing a few hundred shillings into their palms, but it could also mean splurging on any of the vast array of Chinese-imported plastic toys and dolls sold in abundance at make-shift night markets set up for Eid. Throughout the year it’s okay to gently blow off a child’s request for a “shilingi” or two, but during this time of year, you’ll feel like a scrooge without ample change in your pocket, ready for the next gaggle of children seeking out their Eid blessings of cake and coins. Zanzibari weddings rank among the world’s most sensual, layered, and ritualistic events. Full of ceremony and celebration, wedding guests can expect an overload of brightly-lit joy and cheer, often choreographed and photographed throughout the week with moments infused by cardamom-spiced coffee, incense wafting through dancehalls and living rooms. Any woman invited to a wedding will most likely be sequestered, at some point, into a room full of women, where the bride sits decked out in her wedding-finest on the bed while her sisters and friends shower her with love, songs, and presents. The bride is veiled, her feet and hands fully painted with henna and piko, her face, glittering with make-up. In the private intimacy of this room, the bride receives advice from her lady friends as well as various gifts and charms. Any female guest is expected to bring a gift specifically for the bibi harusi, the bride, including anything from a classic kanga (vibrant patterned textile with a written message), chupa ya chai (hot thermos), shuka (bed sheets), glassi (glasses) to a simple cash-stash for nesting. Gifts between women are often presented in private to the bride. Her aunt, sister, or cousin takes on the role of showing the bride her treasures while she sits still and pretty in green, waiting for the official wedding ceremony to begin. Babies are worshipped in Zanzibar. Every new baby is a reason for gift-gifting. Though there aren’t formal gatherings like a Western style “baby shower,” and certainly no online registry, everyone knows that having a baby is both a blessing and a bit of a financial burden, with needs mounting as the baby grows. The mother often stays home anywhere from a month to six months while the baby is swaddled and visitors stop by to coo and cuddle. Though it’s never spoken, the custom is to bring a gift either for mother, baby, or both, including new baby clothes, kanga, or baby supplies like powder or blanket. 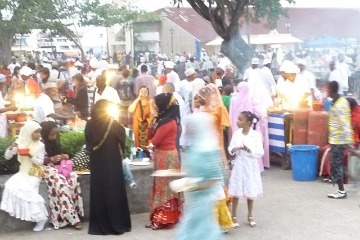 As islanders, most Zanzibaris are expert travelers, sensitive to the rituals of leaving and returning. Preparing for a journey is a family affair: celebratory meals are prepared; contributions are made; travel food is packed; prayers are spoken; blessings are uttered. Many times a traveller is trailed by a parade of family, friends, and neighborhood kids who either accompany him to the port or tag along for an airport goodbye. On an island as tiny as Zanzibar, people are also keenly aware of who’s leaving and returning, when and what time. Your presence is felt; your absence is missed, and if you’re not seen for a few days, people will inevitably ask about you, wanting your travel status update. If they find out you left without telling them, there will at least be some feigned outrage, if not for some genuine sorrow for not having being informed personally. Had they known you were leaving, they would have given you a goodbye gift! Many times a traveler is trailed by a parade of family, friends, and neighborhood kids who either accompany him to the port or tag along for an airport goodbye. The traveller, then, faces a great deal of delirious expectation upon returning to Zanzibar, and will feel so much better coming home with a suitcase full of gifties than empty handed but full of excuses. Again, it doesn’t have to be anything major or expense, but a little token, a little piece of the place, fairly distributed among family and friends, goes a long way. Beyond these top five, there are, of course, other life miracles and milestones that warrant a gift-exchange – a teen’s public graduation, a girl’s private first menstruation, both causes for celebration, though gift specificity depends more on personal preference than cultural norm. Related to gift-giving in Zanzibar is also the notion of mchango or “contribution” in which people pull funds together to build a house, pay for a funeral, chip in for a trip overseas, or bail someone out of jail. In these situations, it’s up to each person to decide what they can give and all amounts are appreciated without judgement, barring the person who can contribute but declines. There’s also the whole concept of zakat, the Islamic principle of charity which guides giving to all those in need as long as the giver is financially stable. The belief is that giving purifies one’s heart and that the act of giving itself is a kind of prayer, a form of thanks to a higher power. It reminds everyone that nothing belongs to us; this life is borrowed, and everything we have is just ours for the duration. This belief circumscribes the overall communal approach to sharing within Swahili cultural life. That’s not to say there isn’t corruption or scandal, greed or desire, but that all of those impulses are tempered by a collective, transcendent faith in something larger than ourselves. It also diffuses the power of materialism, elevating the status of the gift-giving as a spiritual, selfless act that brings us closer to god. 1. Samhani, Nimesehau! Oh, sorry, I forgot [your gift]! 2. Baadaye! Nitakuletea baadaye. Later! I’ll bring [your gift] later. 3. Na zawadi yangu? Bado nasubiri zawadi yangu! And where’s my gift? I’m still waiting for my gift. 4. Umechelewa! Zawadi zimekwisha! Siku nyingine. Oh, you’re too late. They’re all gone. Next time! 5. Hujajua? Zawadi yako ni kuniona tena. Didn’t you know? Your gift is to see me again! I know. I’m encouraging lying now. Really, I’m not a fan of lying. And of course, there are layers of giving and taking. I want to open my heart wider and faster every time I am challenged to give more and do more for others. But sometimes I just can’t. And in those moments, I have to remember that the whole gifty banter itself is really the gift of human encounter. It doesn’t just happen with random foreigner here, it’s a sort of silly street-play performed by everyone who walks the narrowing, winding pathways of Stone Town. It’s a little hook, like someone gone fishing in humanity’s pool, looking to get a nibble from someone as human as they yearn to be – and are — for having called out to the stranger with her market bag overflowing with greens. One time, a little boy around ten years old asked me for a gifty on the street. I told him I didn’t have even one shilling. (True!). Know what he did? He reached into his pocket, pulled out a shiny shilling, pressed it into my hand, and ran away. What are some other traditions regarding gift giving in other cultures? Are they similar to the traditions in Zanzibar? Share in the comments below.